your brand to feature phone users. 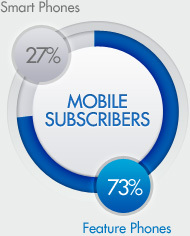 of mobile subscribers in the United States still use a traditional feature phone. of worldwide mobile sales are feature phones. of emerging markets use feature phones. All PicoWireless mobile apps are free and run on any mobile Java (J2ME) or Symbian cellphone. Download our bundle to your cell phone which combines all the rich functionality of PicoMail, PicoWeb, PicoSMS and PicoRSS into a single, essential, free mobile application. Download each of our apps separately for your convenience. Try them out today!